Well, at least you're getting some scrapbooking done, right? The pictures are so pretty. It sounds like you're making the best of it. Your pictures are beautiful. Hope it stops for you soon. We hear we may get another inch tonight, but hopefully no more. A lot of ours if finally melting. I hope we're done. But you're right it is absolutely gorgeous, but now I'd really like to see the gorgeous sun for a while!!! South Georgia says Let It snow too. lol We got three inches Valentine's weekend. First time to have that much in twenty years. So we don't get tired of it. Two feet I'm sure that would be a horse of a different color. Holy Smoke....You are knee deep! WOW!! Hope you have a great day and stay warm. Wow, amazing the amount of snow you have! It's good to be able to still see the beauty that surrounds you. Spring WILL come... in His perfect time. I know it must be incredibly frustrating and wearing, but your pictures are so beautiful! Thanks for sharing, and if I could I'd take a foot or so and spread it around here. I am one of those Cali people overheating today because I chose to wear a long sleeve shirt. HOWEVER, I miss those snowy days of my youth in Iowa. Notice I said days not weeks...ha ha. I feel your pain re: the snow and am hoping that DC doesn't get any more wallops. This too shall melt! The pictures and commentary were beautiful/fun. Unbelievable amount of snow! It's really pretty, though. Hope you have a good DVD collection! Incredible! 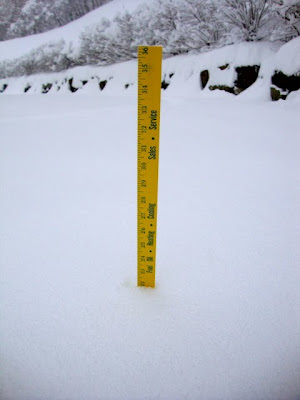 How much snow you´re getting!! Your world looks black and white to me, if not for your red coat. I sure hope it turns warmer soon. Wish I could send you some heat from over here. Showed your pics to my kiddos and they wished they were there! My 10 year old says you could make a lot of snow cream HA! Your pictures are beautiful, I have always loved snow and how it makes everyone slow down from the busy normal everyday life! We have had more snow this year in KY, but nothing to compare to up North! Enjoy!! Snow can be beautiful and being snowed in can be fun as long as everyone is safe at home. Our local news showed a sign at a church that said "whoever is praying for snow, please stop!" Looks gorgeous! I know it must be a pain, but I would love to have that kind of snowfall! Now that's some snow accumulation, Joyce! Wow! At least you all are staying on top of it. I mean, you're keeping it cleared as best you can. Love the pictures and hope you can find something to keep the hubs entertained and occupied with! :-) Mine keeps going from window to window. :-) Gotta love 'em! I would have to say that I am jealous in some ways but see your point after reading your email. I guess it looks pretty but to have so much of it you never really look at it til you've lived in it like you are. Trying to command our stubborn sun to head your way and thaw you all out. Wow, That is a lot of snow! Bless your hearts! It was 59 degrees here today with the sun shining. This is crazy... Be safe! Joyce, I think you guys got all the snow that we usually get! (We currently have none, which is very unusual for this time of year.) Hope it melts soon! It's beautiful, by my goodness!! That's a lot of snow. Joyce, the snow is beautiful in your pictures. If it makes you feel any better... I did have a wonderful time at the beach, but it was COLD!!! No warm conditions there, either. Oh well, it was fun to get away. Hope you got to have your dinner party on Saturday. Love & blessings from NC! I loved your pictures... and loved your title!! As much as I love winter and snow, Spring would be GREAT!! Wow! What a journal all about snow, snow... and more snow. I love the pictures and the way your chronicled the snow, the satellite, and the snow plow guys. It does grate on your last nerve after awhile. I hope you are just about dug out by today. I should chronicle our family flu experience since last Wednesday. The problem is I'm the one who has it now, and should get away from my computer and onto my couch.